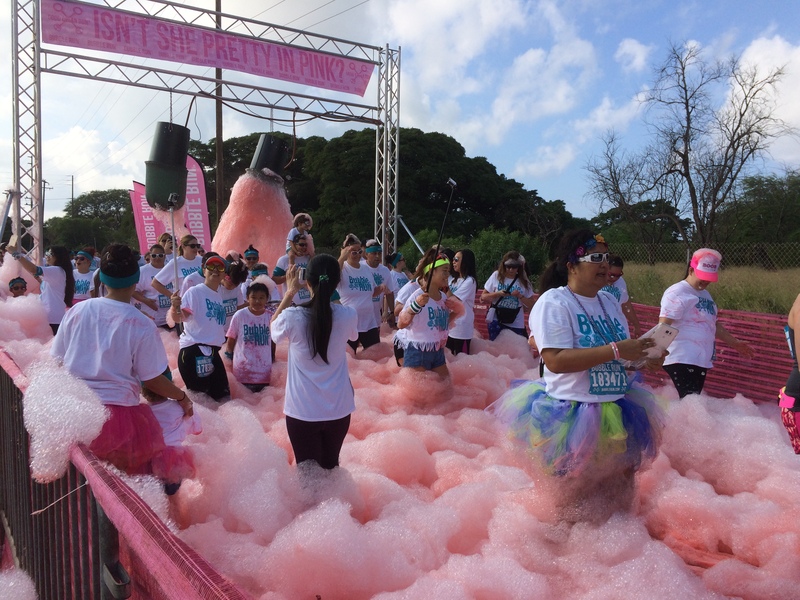 Have you run Bubble Run 5K before? 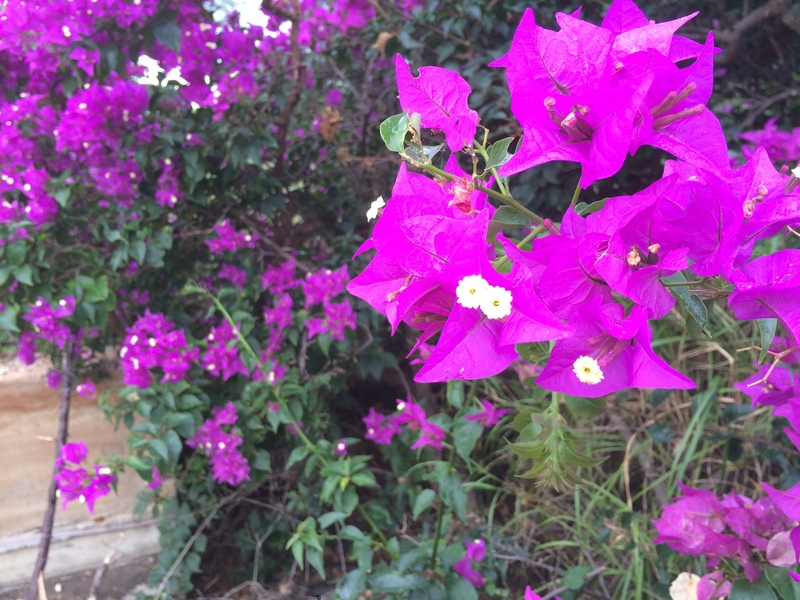 Anyhow…. 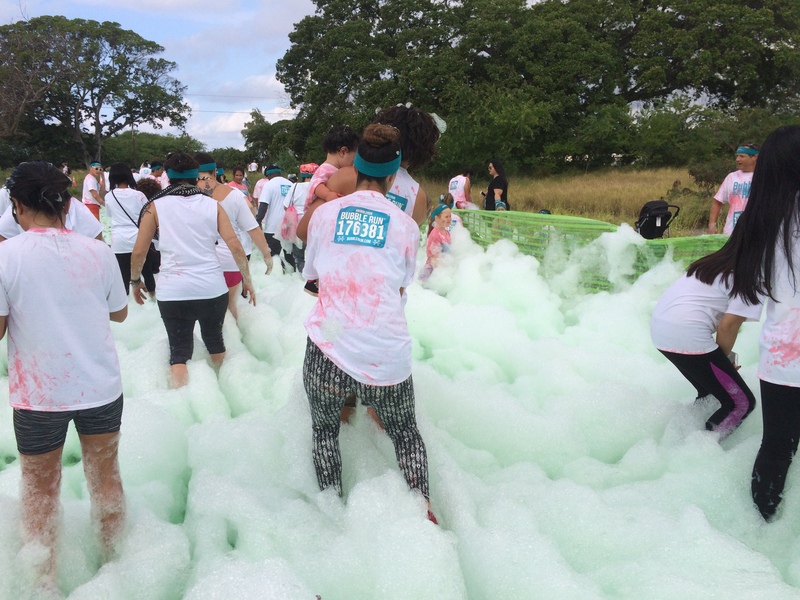 Bubble Run is the funniest run I have ever attended especially for Family! I saw so so so many kids attending this Run whole a lot more than other running events! 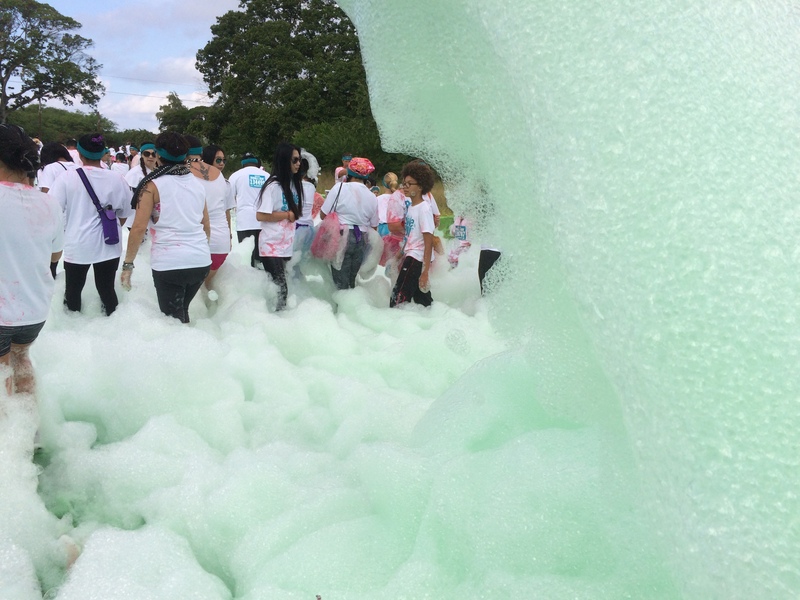 And “Bubble Run”, makes, of course, a lot of bubbles! 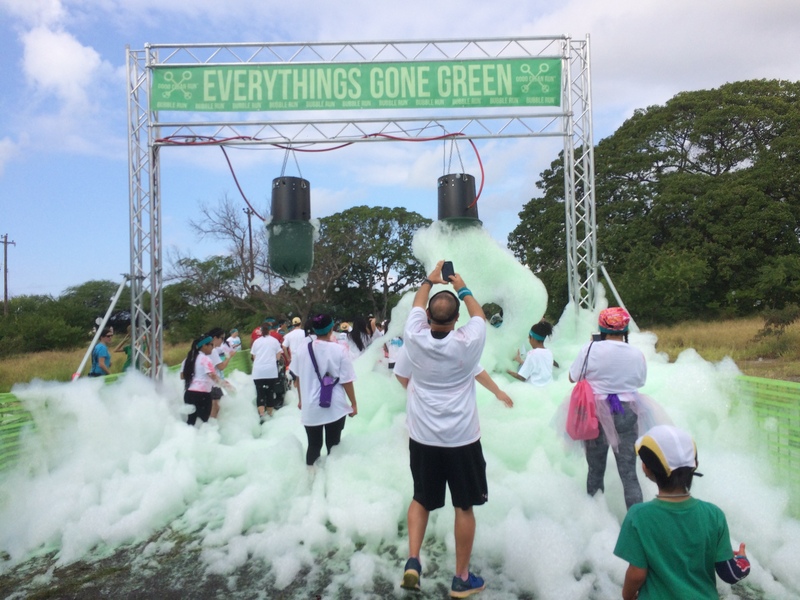 They have total 4, what they call, Foam Bogs throughout the course. 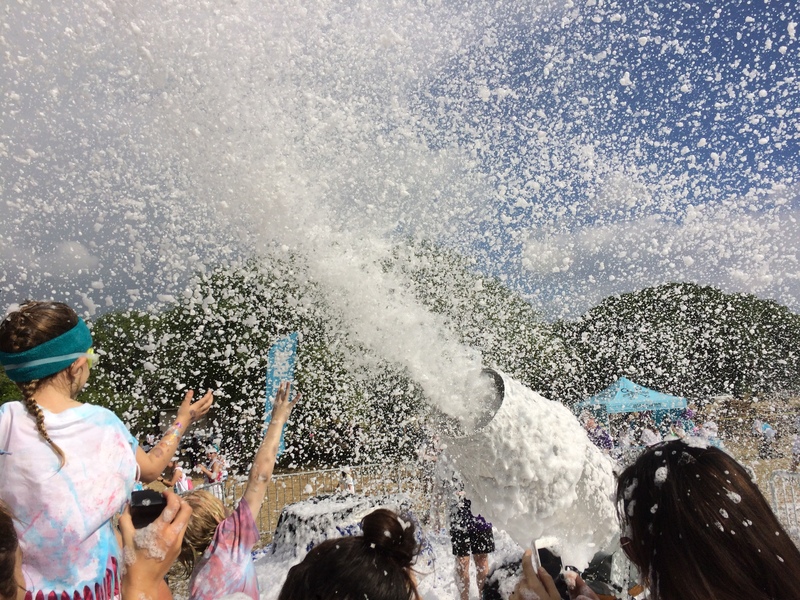 It started with White Bubble!! As I said, many kids were there. 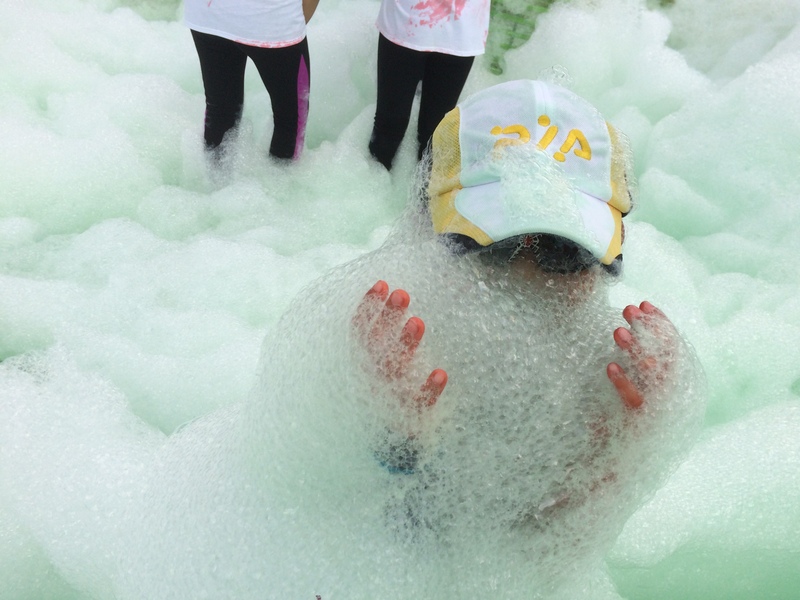 So in this Bubble Run, under 4 years old were totally Free to attend with a purchase of adult entry. 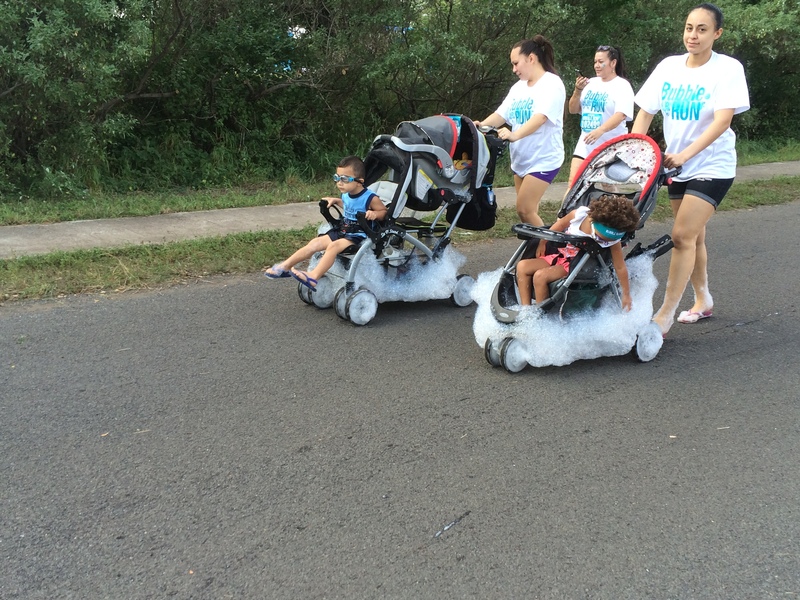 Then, of course, we saw many baby strollers with Bubble such as…. Many were actually walking from the beginning, anticipating another bobble to come! Then, I started noticing that so many runners were wearing the white shirts which was in runner’s packet. It was so many compared to other run. 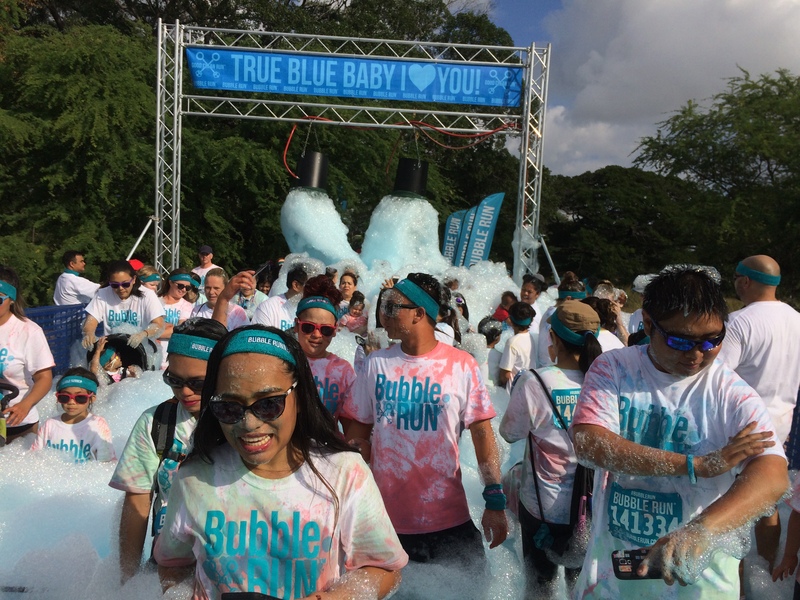 Not many runners would wear the Race shirts even you receive them before the run… But I figured out that one of the best features about this Bubble Run was to color your own shirt!! They prepared 4 different colored bubbles. Everybody had so much fun to color their shirts! 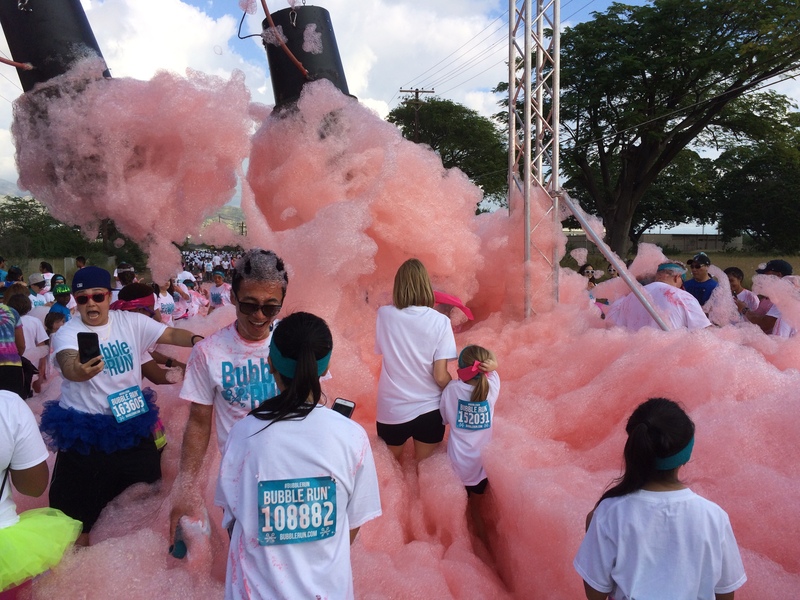 I regretted that I did not wear one this time..
After less than a mile, we encountered the pink Bubble!!! Then, Green Bubble to come! 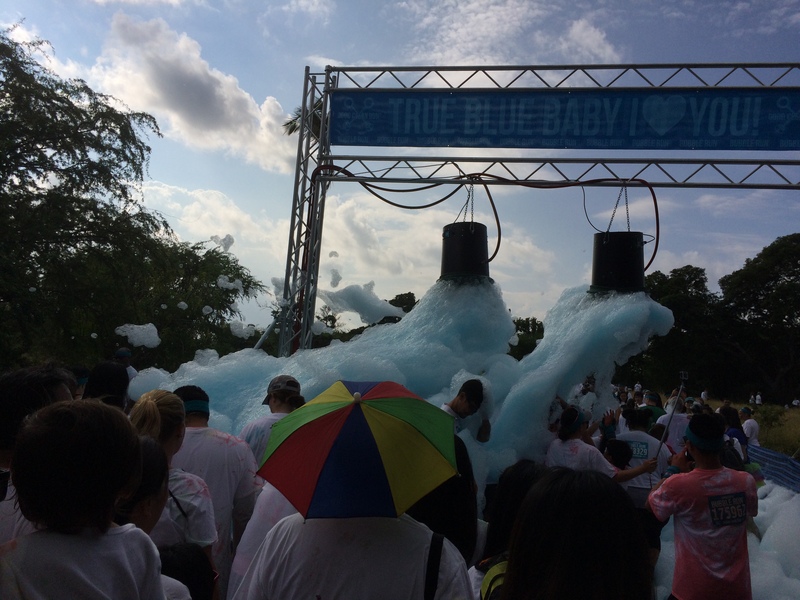 By this time, I could really see how much they played with bubble by the color of the shirts! Then, I started seeing many dads were carrying kids already by this time.. 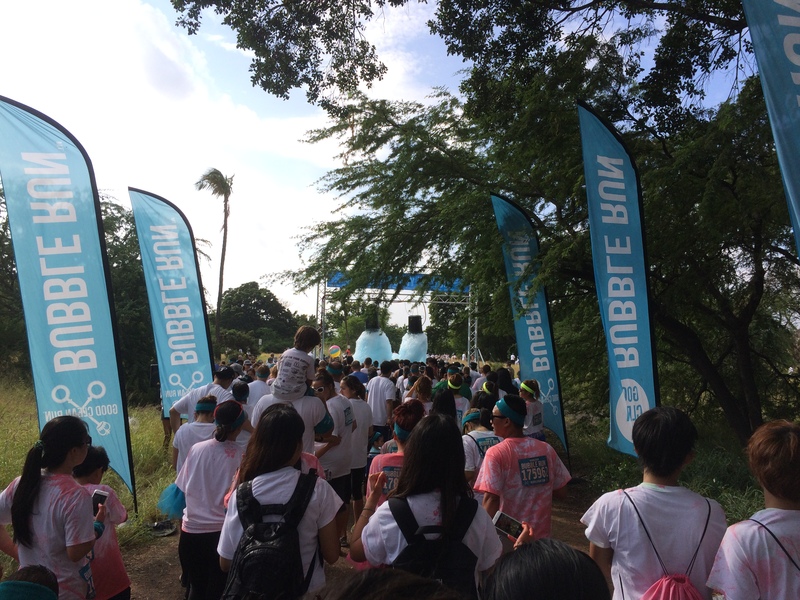 I guess one of the reasons many runners like this Bubble Run is that parents do not have to have too much stress to carry up their children even they start crying and saying “I’m tired… pick me up Dad!” since this is 5K run/walk. Also many runners were pushing a baby stroller with Bubbles. 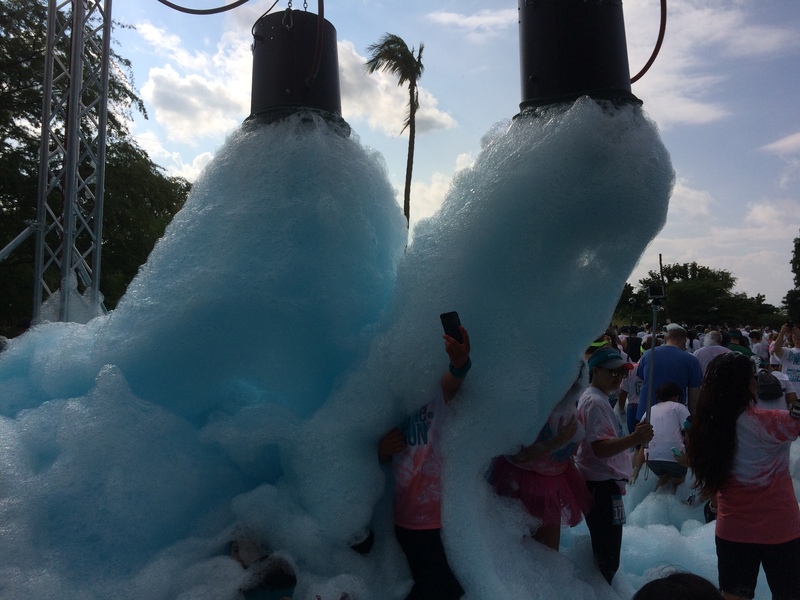 Bubble Run is so kids friendly event. They called runners “Bubblers”. All Bubblers were having fun! Then, we ran for a little more while and went through yellow bubble. A little after that, the finish line was there already. It was not the end of it….. After that, we found a wired looking cannon. And people were waiting for something. Everybody was looking at the staffs right next to the cannon. Yes! This was a Big Welcome Back Bubble Canon! 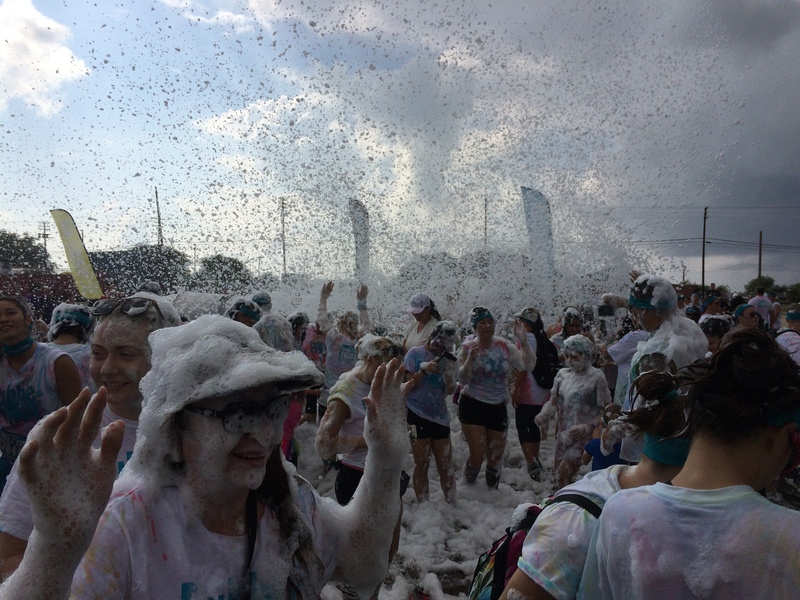 That’s how Bubble Run went. Overall, it was a great fun run/walk, a great event to attend with family and friends. 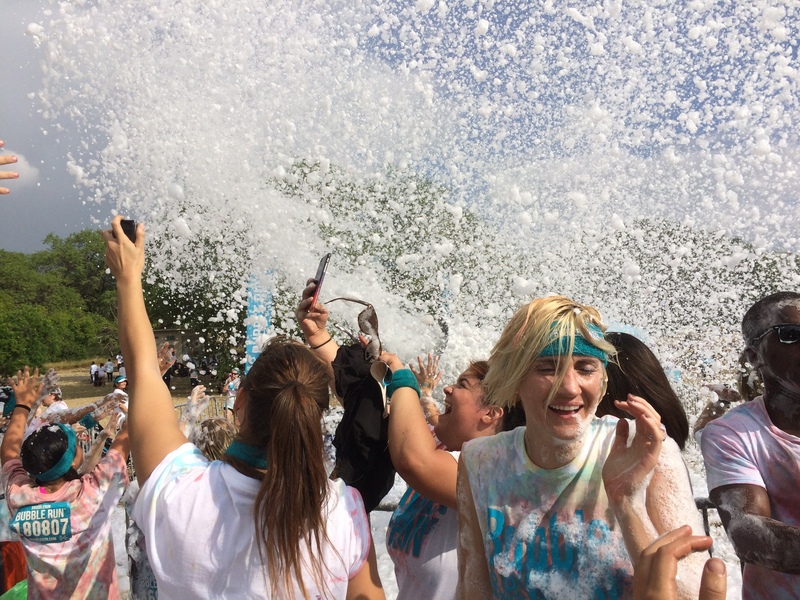 Especially, Bubble Run is kids and family friendly. 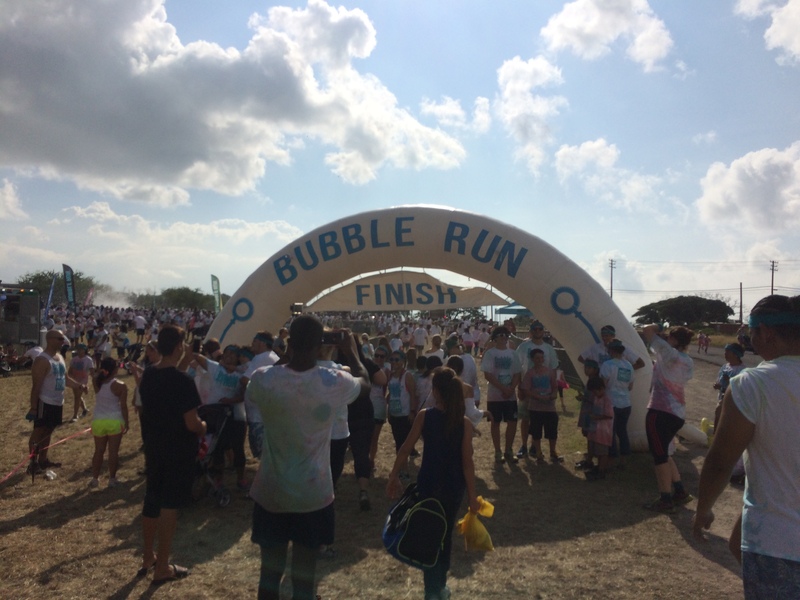 I myself attended this Bubble Run with my 2 sons this time. And it was fun! 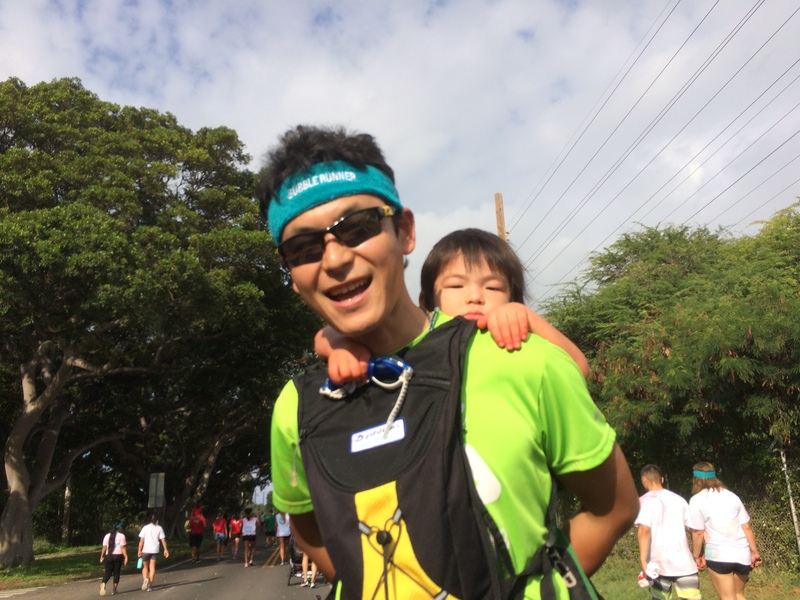 After the run, I feel more bonding with my kids. It was whole a lot more than just a run. Great family event! 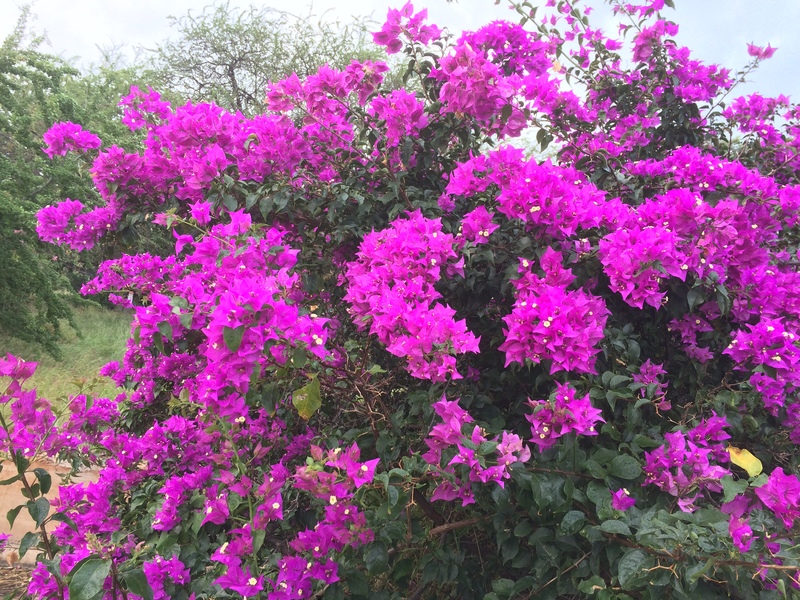 At the end, on the way back to our car, I found nice Bougainvillea on a side street. 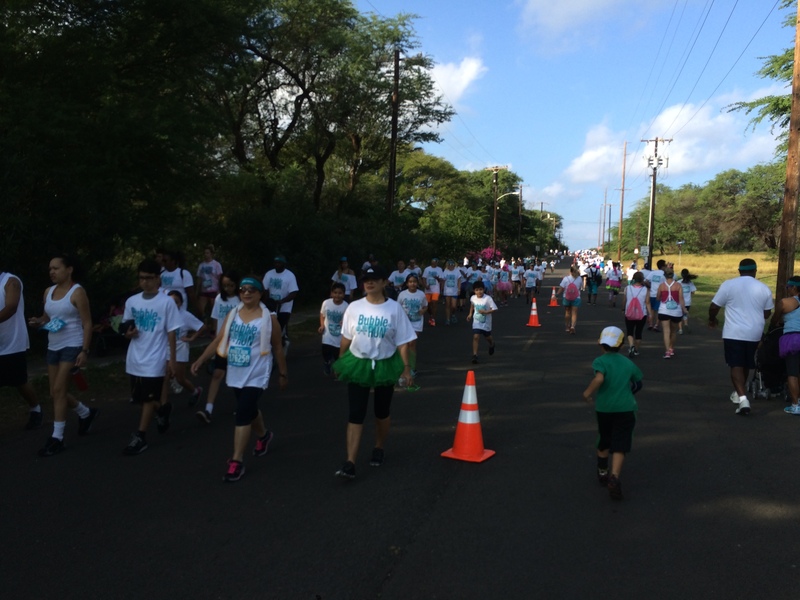 Honolulu Marathon 2015 Phiten 6 days Events!